Mary Cathcart was born to the 9th Earl of Cathcart who just happened to be the ambassador to Catherine the Great in Russia. This meant Mary enjoyed her upbringing with her brothers and sisters in the fashionable country. When she returned to England she was immediately married off to Thomas Graham at the age of 17. Thomas was not a peer but he was distinguished and owned a lot of land. He wasn’t the brightest man but he dearly loved Mary. There is a story that when she forgot her jewelery box for a ball Thomas immediately jumped on his horse and raced 90 miles and back to fetch it for her. Indeed, she was beautiful and gentle and many found it hard not to like her which may have earned her the nickname The Beautiful Mrs. Graham. 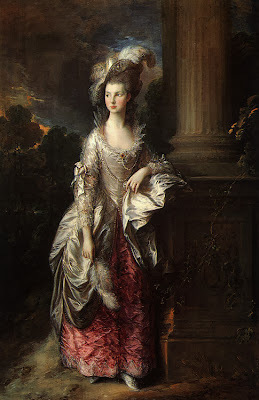 One of the people to fall under her charms was Thomas Gainsborough. He found her beauty to be exotic and could not help to paint her as much as possible, even if she wasn’t there. It is very likely he was head over heels for her. Unfortunately the much-loved Mrs. Graham was very sick. She had tuberculosis which caused her to be very frail.